Wellseal is arguably one of the best available gasket jointing compounds yet is not readily obtainable through general motor factors. In the past, we have used Hylomar, Heldite and Hematite compounds, amongst others. 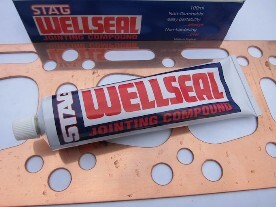 Wellseal is generally regarded by many as the jointing compound of choice for elite MMM engine builders.